When you’re sitting there having electricity pumped into your brain, you can’t help but wonder what you’ve signed up for. 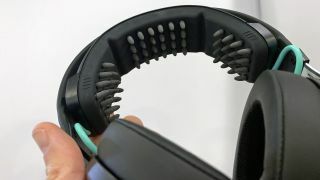 That’s what happened when we tried out the new Halo Sport 2 headphones, tech that delivers an electrical current to the motor center of your brain. 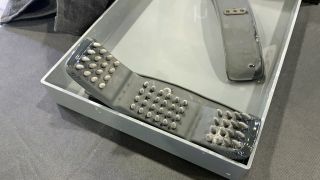 The idea is to use this device for 20 minutes before an activity to create a state of ‘hyper-learning’ by neuropriming. This means exciting the tissue in your brain artificially before an activity, basically improving your capability to learn and embed new movements. The theory goes that if your brain is more ‘plastic’ when you try to learn a new skill, be it drumming, running correctly or shooting three pointers in basketball, you’ll absorb it quicker. When asked about how it worked, Halo Neuroscience CEO Daniel Chao told us about how it was important to target clusters of neurons in the brain because ‘if these fire together, they wire together’. So if you’re getting ready to train your fingers to play guitar, 20 minutes with the Halo Sport headphones will get your neurons excited. Then the chances of two neurons firing together and creating new pathways in the brain are improved. The original Halo Sport came out a couple of years ago, based on this technology, as way for athletes to gain an extra edge in their training. 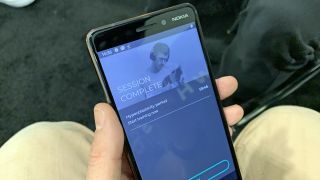 Since then they’ve been used by a variety of different sportspeople, medical professionals, the military and musicians to improve their motor skills in key moments – with the headphones offering up to 50% benefit when it comes to this form of learning, according to Halo. Enough of the science – what’s it like to use? Looking at the Halo Sport 2 headphones, they’re daunting. The cups are large and ear-encompassing, and the spikey primers on the top (they’re technically electrodes, but Chao told us that they changed the name to make it sound a bit less intense) look like they’re going to bore into your skull or something. Thankfully they’re just soft foam, that needs to be made wet before application to ensure better conductivity with the skull and allowing the neuro-priming to work more effectively. The headphones themselves feel well-built and have a firm hold on the head, making it easy to get the fit you want. This is important, as the companion app from Halo needs to confirm it’s making clear contact with your head before the process can begin. That process is unlike anything we’ve felt before. The second you start, and the app tells you that it’s ‘ramping up’, you’ll begin to feel a tingling in the skull where the electrodes… sorry, primers are. This feels strange, but not uncomfortable. The only issue is the small part of your mind that’s worried about passing electricity into the most important organ in your body – what if it goes wrong? That sensation quickly diminished, and we were cranking the intensity up to the maximum level to experience how it felt. Again, it felt strange but Chao told us that this was normal and people who bought the Halo Sport 2 mostly spent time at nine or 10 levels when using the system. 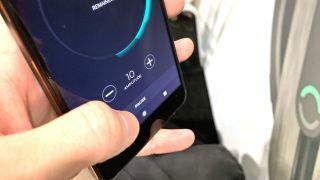 From there, one would use the system for 20 minutes before beginning the task in hand – after that you’re going to have an hour’s window where your brains synapses are firing harder across the motor cortex (coincidentally, in the same place as where a headphone band naturally sits) and you’re ready to learn. 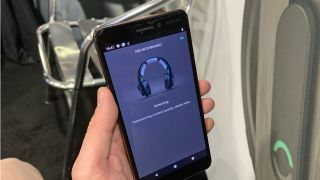 The audio quality of the new version of the Halo Sport headphones is impressive – especially when you consider that in the first version the brand just ‘chucked some audio drivers and speakers inside’ the cups. Because originally this system wasn’t conceived as a set of headphones, but a band that looped over the head and hooked behind the ears – but Chao said it just looked too ugly. The ear cups were added for comfort and style, and wired headphones were put in as an afterthought. 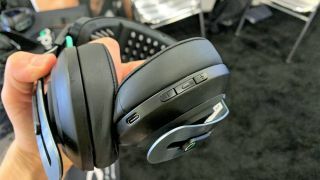 The audio quality of the new Halo headphones is pretty good, with Chao claiming that they believe they easily stack up against anything that Bose or JBL offer. 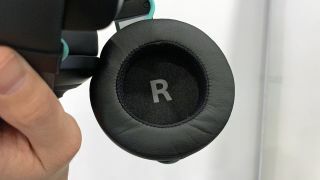 While we didn’t spend hours listening to different styles of music, the audio quality in vocals was pretty good – and you can remove the primer spikes to make wearing the headphones more comfortable day to day. The idea is an interesting one, unlocking something as simple as firing an electrical current into the brain to improve performance. It’s called transcranial direct current stimulation (TCDS), which is just as described above – the idea of stimulating the brain to achieve a heightened state of learning. This is something that’s been studied for decades, but only now are we starting to see its use outside of laboratories. “Our secret sauce is just electrical current” says Chao, pointing out that the key thing is that these headphones alone won’t make you any better at a given skill just by wearing them alone. “We think of ourselves like fertilizer” says Chao, highlighting that the need to know what you’re trying to improve upon is key before starting sessions with the Halo Sport 2 and app combination. Think of it more as removing that frustration when you’re trying to get your body to learn how to do something and you keep getting it wrong, before you finally begin to improve with time. If it’s something new, then the steep, positive learning curve is only going to get steeper, says Chao. If this was something like ping pong practice or learning to juggle, he claims using the headphones will dramatically increase your performance. For a high-level sportsman, musician or any kind of trained individual, that learning curve isn’t going to be as dramatic – the progress will only come when trying to adopt a new skill as the motor pathways are already pretty much set. For a runner, this could be trying to run more on the forefoot, or keep up your hips when sprinting, in a bid to become more efficient. The thing that keeps coming across is that the headphones will only help you absorb that skill faster, not mutate your body to be able to do it instantly. That leads nicely onto the key thing about these Sport 2 headphones – the price. The first set cost $749 (around £620 / AU$1100) but that’s been dropped to $399 (around £310 / AU$555) thanks to higher economies of scale as more sets are sold (and only $299 for the early bird buyer). For a company that’s raised nearly $25m in its time, that’s the kind of price point it needs to be looking towards to build a wider user base. The idea of shocking your brain to get faster, stronger or more adept is a hard enough sell as it is, so spending a huge amount of money to do so isn’t going to go down too well. 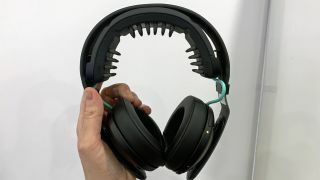 Let’s also address the big issue that many (including us) might have before using these headphones for the first time: the question over whether firing electricity into a targeted part of the head is safe or not. When researching the company and the tech it’s using, there are some threads openly questioning whether the technology is snake oil, a fake that seems cool but does nothing. Others are asking whether they’re even safe to use. There are two elements here: whether TCDS is safe, and whether the Halo Sport headphones are using it effectively. The former point has a lot of science and study behind it, and it seems pretty clear that TDCS is safe to use with minimal side effects. Chao says Halo is conducting clinical trials of new way to use its tech (such as with rehabilitating stroke victims), and has done a study of a quarter of a million sessions – and the findings are in line with those seen in peer-reviewed studies on the tech. It doesn’t appear that the science Halo is pushing has been peer-reviewed just yet, but further clinical studies are being looked at. 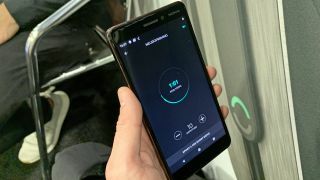 Halo’s own website makes a promise on its website that the technology is 100% safe, and that the FDA has ruled the Halo Sport headphones as ‘general wellness’ devices, which are safe to use for healthy users. That doesn’t mean that potential users shouldn’t check out whether they’re right for them, but it looks like the science has been thoroughly tested and Halo is claiming 1400 healthy users have tried them with no ill-effects. One of the questions we asked Chao was the potential for improving other areas of the brain, and he said that he’d heard anecdotally that some users were placing the primers on other parts of the head – such as the pre-frontal cortex – and the brand was aware of the possibility of creating something to activate other parts of the mind. One possibility we asked was to help with mood alteration, to promote the idea of ‘flow’ in a user – giving the user the chance to focus more easily, observing fewer distractions and being able to just feel like they’re capable of giving more headspace to the task at hand. When that’s used in things like high-pressure sport, or even just a tough 10K run for the average athlete, that would be an incredibly useful extra – but apparently this isn’t the current or core focus for Halo Neuroscience, a brand looking to convince users that brain stimulation is safe and a powerful tool worth investing in. That confirmation needs to be more than just the Halo website promising it’s really safe – even though the proof it has created is thoroughly convincing – but we’re looking forward to trying out the training modes to see if it will improve materially what we think we can already do.